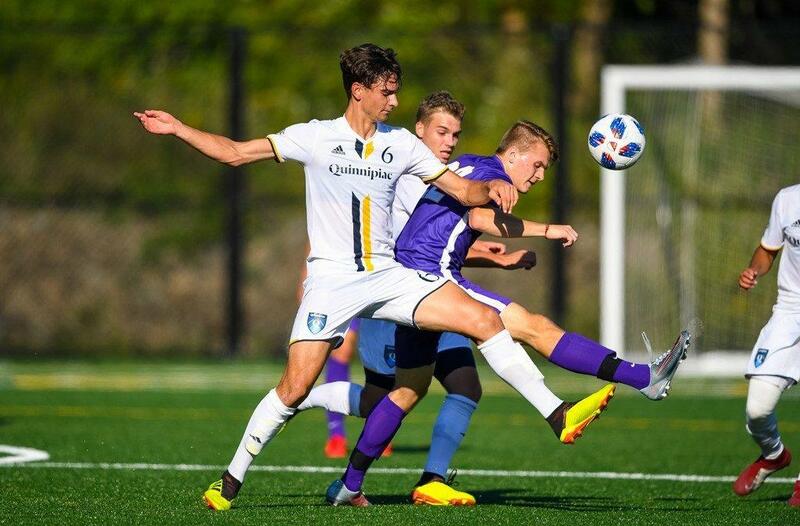 Fresh off a close 3-2 victory over the Saint Peter’s Peacocks in New Jersey, the Quinnipiac Bobcats men’s soccer team (4-4-1, 2-0-0 MAAC) host their conference home opener on Senior Day versus the Manhattan Jaspers (9-2-0, 2-1-0 MAAC) in Hamden Saturday afternoon. The Bobcats are riding high on a 4-game winning streak, with both conference wins coming away this season, while the Jaspers’ last three conference matches have all been determined by a one goal, with wins against Monmouth and Siena and a loss at home versus Saint Peter’s. Senior midfielder Matthew Taylor is second on the teams in points, goals, and assists coming into the game against Manhattan. With eight points on the season (three goals, two assists) the senior captain has shown the leadership he possesses and has looked to be the man who can score behind Junior Eamon Whelan (six goals, one assist). Taylor has made 65 career appearances for the bobcats, scoring 11 goals and setting up nine others. On the other side of the pitch, sophomore forward Berti Fourrier has had huge impact this season for the Jaspers. Fourrier has scored three goals so far and assisted on five others. Fourrier, combined with forward Brandon Joseph-Buadi, have scored eight goals and assisted on six others, which totals to 22 points. The sophomore from Marseille, France will look to use his size and ability on the ball to carve up defenses and put more goals in the back of the net. If Quinnipiac want to come out of Hamden on senior day with a win, they will have to shut down the net. The back four will have to play exceptionally well against one the best one-two punches in the MAAC with Fourrier and Joseph-Buadi. Both players are within the top five in points in the Metro Atlantic Athletic Conference. Goalkeeper Jared Mazzola has played extremely well so far this year, averaging just over one goal against per game in the six he has played. Mazzola, or Iakovidis, and the entire defense will have to stay sharp and mark the two deadly forwards on Manhattan. One key for Manhattan is to get the offense going, and get it going early. Obviously, Joseph-Buadi and Fourrier are some of the best in the MAAC this year, but others need to contribute. Defender Adrien Awana has put up four goals on the season and will look to provide an impact from the back. Another key is going to be the goalkeeping for the Jaspers. Junior Marcellin Gohier had one of the best seasons any Manhattan goalkeeper has seen for a while, earning 2017 MAAC Goalkeeper of the Year and was on the 2017 All-MAAC First Team. He is one of, if not the best, goalie the MAAC has to offer, with an incredible 2017 season, coming in seventh in save percentage, and 15th in goals against in the NCAA. The Bobcats and the Jaspers kick off and 2 p.m. at the Quinnipiac soccer field. The game can be streamed live at QuinnipiacBobcats.com with Max Schreiber and Connor Ullathorne on the broadcast, and more updates can be found on twitter at @QBSN, @connorully5, and @maxschreiber27.